In form Welling United stand between the Cards and the first-round proper of the Emirates FA Cup as the National League South promotion rivals go head-to-head at Kingfield on Saturday. Alan Dowson has seen his side endure a difficult run of league results, with three draws and one defeat since beating current league leaders Billericay Town at the start of September, with the Wings leapfrogging the Cards into second place on goal difference after our 1-1 draw with Chelmsford City. Meanwhile, Steve King’s side have taken 13 points out of a possible 15 from their last five games to charge up the table and are now unbeaten in all competitions since mid-August. Despite both sides enjoying a strong start to the season – with identical league records and progress through two rounds of the FA Cup – both managers have significant injury concerns ahead of Saturday’s match-up. The Cards biggest struggles continue to be in midfield, where Christian Jolley and Kane Ferdinand are both long-term absentees, whilst this week Welling have had the unwelcome news that star playmaker Jack Jebb is out for the rest of the season. This promises to be an excellent game so please take advantage of the reduced ticket prices if you can and come along and cheer on the team – a potentially mouth-watering tie against the likes of Portsmouth or Sunderland awaits the winners! Dowse made a number of changes for the game with Chelmsford – handing debuts to two new signings, centre-back Ben Gerring from Billericay, and Stevenage-loanee Donovan Makoma in centre midfield. Nicky Wheeler also returned to the starting line-up in place of Paul Hodges who dropped to the bench. In terms of options to change things up, neither Kiran Khinda-John nor Daniel Spence made the bench against the Clarets, suggesting that the current back-four of Ian Gayle, Josh Casey, Jack Cook and new-man Gerring might be the favoured option for the time being in front of goalkeeper Craig Ross. In midfield, Charlie Hester-Cook impressed in the last round of the cup against Kempston and was on the bench against Chelmsford, so could provide an alternative to either Makoma or Nathan Collier. The front four is where Dowse has plenty of options with Hodges, Greg Luer, Reggie Young and Duane Ofori-Acheampong all waiting in the wings, but with Jake Hyde and Jamar Loza in particularly encouraging form chances could be limited for those on the fringes. The Wings have defeated Chesham United (2-1) and Hereford (2-0) to progress this far in the FA Cup. Their last game was a 2-1 league win over Slough Town – which included a late winner from on-loan Billericay striker Adam Coombes. Their squad includes several familiar names. Against Slough, King started with Dan Wilks in goal; a back four of Jordan Gibbons, former Woking winger Charles Banya, experienced Frenchman Thierry Audel, formerly of Notts County and Barrow, and Josh Hill, a National League South promotion winner with both Boreham Wood and last season’s Braintree Town side; in midfield was Jebb, who went off with his season-ending injury, alongside one-time Derby County midfielder Arnaud Mendy, with a former Dowson player, ex-Hampton man Brendan Kiernan, and the intriguingly named Nassim L'Ghoul providing the width; up front was Coombes, who scored 20 goals in 24 games during a previous spell with the Wings in the 2016/17 season, and Bradley Goldberg who has been a regular scorer for Bromley in the past. Their bench included striker Matt Paterson, who scored twice against the Cards for Oxford City back in August and has recently joined the club, along with another dangerman in on-loan Ebbsfleet United forward Danny Mills. Their squad also includes several former Cards in Craig Braham-Barrett, Richard Orlu, Gavin McCallum and Nathaniel Pinney but none made the squad last time out. 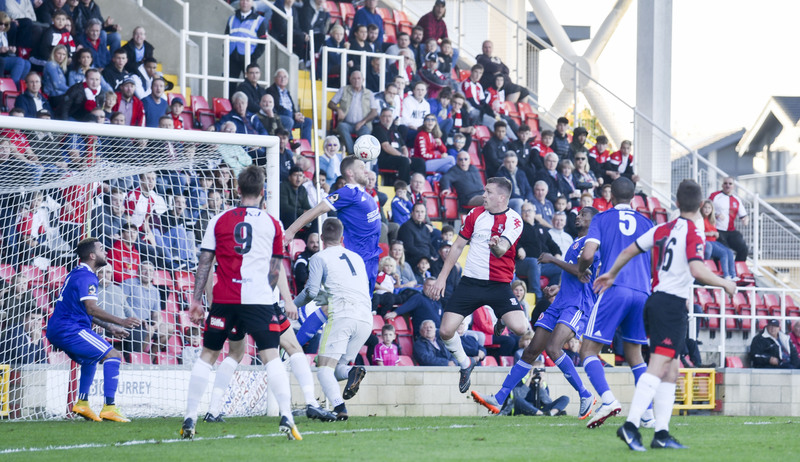 The Cards continue a run of five consecutive home matches throughout October with next week’s double header – starting against Bath City on Saturday before Hungerford Town are the visitors three days later. Our next away trip is at Chippenham Town at the start of November. Get closer to the action with our Pitchside highlights as we take a look at Woking's 1-0 triumph in the FA Cup 4th Qualifying Round against league rivals Welling United! Dowse reveals who he would like in the 1st Round Draw of the FA Cup after a tense 1-0 victory against league rivals Welling United!